t*rexes and tiaras: Maybe I like this roller coaster.. This week has seen temperatures dropping, so I've been all about the layers. 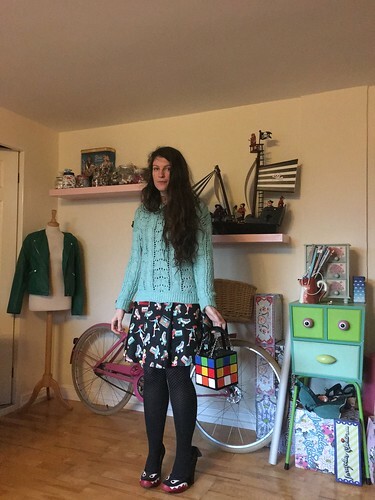 Thick tights, dresses with cosy jumpers over them. Shark heels (well, that has nothing to do with the cold really). I have to admit, when I first saw this dress I figured I'd wear it with red, mostly down to it's cute red patch pockets, I guess. 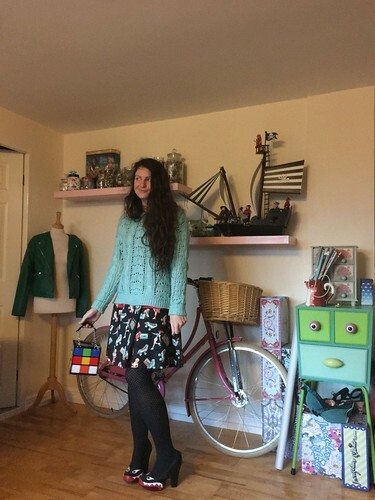 Somehow instead I decided to go with this cosy pale blue jumper, dark tights with teeny polka dots, and my shark heels, which I guess have a little red on them. 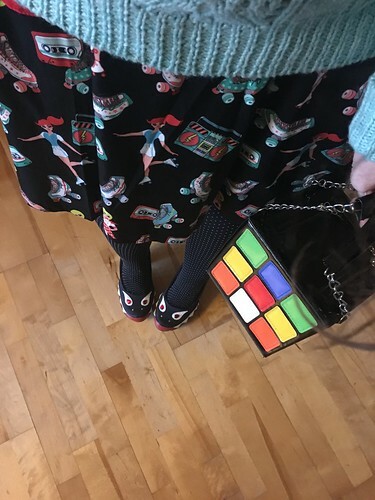 This awesome handbag, which was a very kind Christmas gift from the lovely Kezzie seemed like the perfect thing with the retro print of roller skates and radios. I haven't much else to say at the moment. Some really rubbish things have happened, but they're kind of massive and I don't know where or how to start. So I'll just keep this focussed on the pretty shoes. Seems safer. Wow. This bag is amazing! Red will look great, but I love how you've styled it here, with all the different colours, it's brilliantly versatile.